The WordPress Shopping Cart and WP eStore plugins use the express checkout model for a simple and quick checkout process. Typical online checkouts require customers to work through numerous steps, which involve entering personal, financial and delivery information. The fact is, every step in this often-tedious and frustrating process presents a real risk that your customer will change their mind and abandon the shopping cart. The express checkout model allows you to fast track your checkout process by tapping into personal, financial and delivery information which existing PayPal customers already have stored with PayPal. Customers can checkout quickly with WP eStore as it requires minimum number of clicks and form filling from your users to perform a checkout (this helps keeping the cart abandonment rate low). What is (Instant Payment Notification) IPN? Instant Payment Notification (IPN) is PayPal’s interface for handling real-time purchase confirmation and server-to-server communications. IPN delivers immediate notification and confirmation of PayPal payments you receive and provides status and additional data on pending, cancelled, or failed transactions. 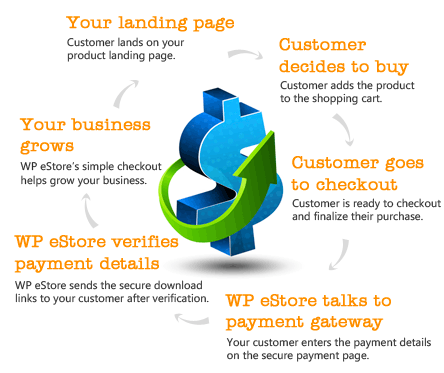 How does the WP eStore Plugin Work? Most e-Commerce plugins take over your blog by automatically creating all kinds of pages for products and checkout and doesn’t give the ultimate flexibility in how you display a product. I am not saying it doesn’t have it’s usage but what if you wanted to fully design how your product display looks like and where exactly the “Add to Cart” buttons and the “Shopping Cart” appear? What if you wanted to sell something from your blog posts and pages? What if you wanted a shopping cart that integrates nicely into your existing site without having to redesign? The WP eStore doesn’t create anything for you automatically, instead it gives you the building blocks of an e-Commerce site so you can build it the way you want it to look and function. After you Add/Configure a product, you can display it in various ways anywhere you like on your WordPress powered site (eg. in the post, page, header, footer, sidebar etc). You use a special piece of text (shortcodes) in your post or page where you want the product to be displayed. You can tell it to give you a bare “Add to Cart”, “Buy Now” or “Subscription” button on a post or page so you can fully design the product display with images and description yourself. You can also use a pre-configured product display template to display the product if you don’t like to design the product display. The eStore comes with a few product display templates (You can see some examples here). Once you have the Buy buttons in place, you can display the shopping cart wherever you like on your site. Again this is done through the use of a special piece of text (shortcode). You can create a “Checkout” page and display the shopping cart there or you can place the shopping cart on the same page where the buttons are or on the sidebar (the choice is yours). All the WP eStore shortcodes and function references (building blocks of your eCommerce site) can be found here. The following block diagram gives an overview of the typical actions involved in a complete transaction cycle. 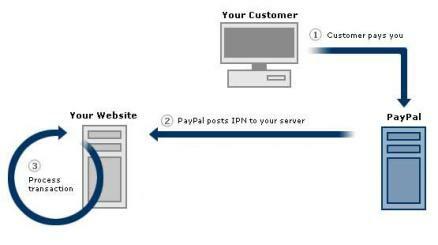 This example uses PayPal as the payment gateway. The same principal applies to any payment gateway checkout via eStore. You receive the money in your PayPal account and the buyer gets an encrypted dynamically generated download link for the product in an email. There are a number of parameters that are verified before the digital product is delivered to the customer. This following diagram explains what happens in the background once a customer makes a payment for a product. 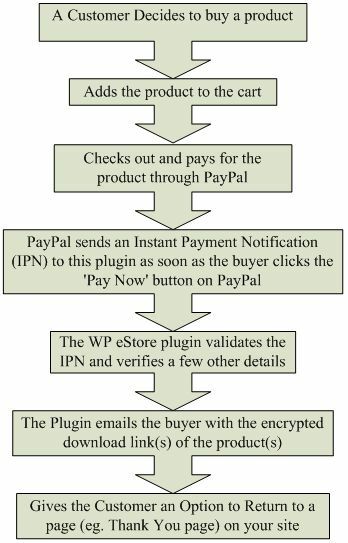 This example uses PayPal as the payment gateway. The same principal applies to any payment gateway checkout via eStore. PayPal normally figures out if you have a PayPal account or not from the cookies on your computer. Try deleting all the cookies and hit the checkout button to go to PayPal and it will present you with the option to pay by credit card upfront (similar to the screenshot below). Note: If you want to use recurring/subscription payment option and would like to accept credit card for the recurring payment then PayPal may require you to add “Enhanced Billing” option to your PayPal merchant account. Is there a way to offer e-books in either PDF or mobi (Kindle) version and have it automated? @Anjan, Yes the shopping cart will clear after the purchase is made. Can the shopping cart clear once the purchase has been made? Hi, i want to use this for my products to sell on my blog for coats but I have variations, i want the customer to be able to select their size in a drop down box – can this be done? I havent tried your plugin yet but it looks interesting for my needs. I have a plugin/theme repo on my server with license system and auto updates. Is it possible with your plugin to add a call to my api when IPN validates? @Justin, No you do not need an SSL on your site for the standard PayPal integration option. 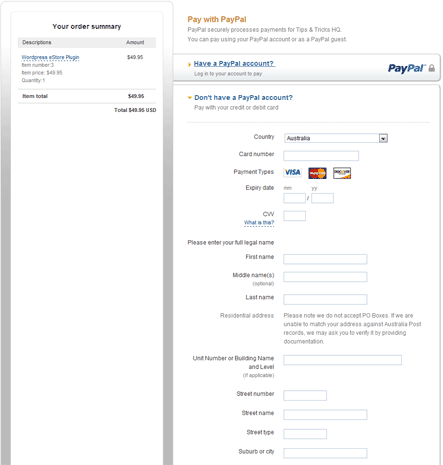 The payment is processed on PayPal’s site so it uses PayPal’s SSL. However note if you want to use PayPal Pro (paid service from PayPal this is not the standard integration that comes with the eStore) to process payments on your site you will need an SSL as you are processing the payments on site. However it is fully up to you if you want to use a SSL on your site you can do this even if you use the standard integration option if you want to. I was browsing through your website … and this product has really caught my eye , I am just curious to know , does one need SSL on their site for the paypal option ? I’m glad I found a Blog that deals with the same thing I’m dealing with. I always read the whole article and keep an eye on other comments too before commenting myself. In this way i have found some good site that I now follow beyond the purpose of getting links from them. For example, this is my sixth stopping over your site. I always love the content and the way you write . @Jai, There is a customer input option in the eStore, however please note that the characters are limited this is 320 including the name of the product and any variations the product may have. Is it possible to have a textbox that you can write messages in that is sent along with payment info to PayPal? @ Daniel, The eStore has an option to post the IPN to another plugin or script. This is the option you can find in the eStore. If you want eStore to post the (instant payment notification)IPN to another URL for 3rd party integration then specify the IPN Post URL here. I am thinking of implementing your plug-in, but what themes do you recommend? Hi , am planning to buy your plug in , please tell me which is the best estore theme that will work the best with the estore plugin. Sorry, please ignore my last post. Had the wrong email address in my settings! Thanks for a great product! Hi, I’m developing a website using your great WP Simple Paypal Shopping Cart plugin. So easy! However, I am experiencing one issue that is crucial to the site’s success. When someone adds an item to the cart and hits the checkout button, they’re taken to paypal and are given two payment options – pay using an existing paypal account or “create a paypal account” and pay using credit or debit card. I don’t want users to have to create a paypal account so that they can pay using their bank cards. It defeats the purpose. Any idea why this is happening? It’s linked to a paypal business account. Hi, Here is a list of plugins that are known to cause a issue with our plugins. Hi, No there is no way to force PayPal to display the classic checkout. This has to do with PayPal they have changed to their enhanced checkout, they have been slowing rolling this out for about 6 months now. Is there any way to get the plugin to use the PayPal classic checkout? Hi Alec, PayPal does not allow you to accept credit card payments with a personal account. You would need to upgrade your account to a business/merchant account. I have bought your package of plugins including eStore. You suggest above that “buyers can pay using a Credit Card or their PayPal account” but this seems to be not my case. By clicking on a paypal button in my shopping cart form I land on the paypal payment page which offers two options – either to pay through an existing paypal account or to register for a paypal account. No sign of any other way to pay by credit card!!!??? What can be wrong with my settings? Since I use my individual paypal account in my settings – would it cause such problem? I have a customer who wants to use Authorize.Net and not PayPal. Is there a way to do this with your module. If so can you direct me to any support link or info?? I’m sorry I’m confused, how do you keep the thank you page from showing on the site? Do you set the page to private? Great plugin! I am looking to use this for non down-loadable products and also need to have an option for customers to choose from a list of colors / options when purchasing the product(s). Is the an option in the plugin for this? That plugin would be: WP Simple Paypal Shopping cart v2.6. I believe it is the free version. The plan is to get the paid version. Just want to make sure it is what we need as the intention is to sell a physical product. Hi Bryan, Can you please tell me which plugin you are using? At one point to we put in shipping costs and/or sales tax for physical items. I have some familiarity with that using the ‘Buy Now’ button, but am a bit confused how it fits in with you plugin. Thanks..
You are forgetting that after the payment the customer do need to see the PayPal receipt which is available on the “Payment Confirmation” page. This is why by default auto redirect is off and even if you turn it on it won’t work for credit card payment. Yes you are right but the way PayPal works is that after they make a payment on PayPal they will be shown a confirmation page. On that page there will be a link/button that says “Return to Merchant”. When the customer clicks on that link he/she will be redirected to the “Return URL” (it won’t happen automatically). Not sure I follow. I have the Return URL in the e-store settings set to this: http://groceryuniversity.com/thank-you The Return URL description says “This is the URL the customer will be redirected to after a successful payment”. Doesn’t that mean that when someone completes payment through Paypal, they should be redirected to the URL I specify (which contains the shortcode for the download links)? Hi Carrie, You would need to turn the “Auto Redirect” option on in your PayPal Profile. Please note if you turn on auto redirect the links will no longer show on your thank you page. Also the post payment clean up such as the cart emptying after purchase will not happen. This only happens when the return to merchant button is clicked. When this button is clicked PayPal will send some Post Payment information back to the site. This information is needed to verify information for the links and clean up to happen. When a customer is redirected back to the site this information is not sent by PayPal. When placing an order, everything goes GREAT except that once I land on the Paypal payment confirmation page, it doesn’t auto-redirect to the downloads page. I can click on the “return to merchant” link and it goes back to my site and the downloads page, but shouldn’t it be returning there automatically? Have tried in both FF and Safari and can’t seem to get it to redirect. Could it be that paypal has a problem with redirecting to a non-secure page? I would love to have a subcribe button for an e-zine with recurring payments (yearly) integrated with Paypal. Do my customers get emails when their subscription needs to be renewed? We do plan to add Google Check out in the feature but the ETA of this is unknown at this time. Does the estore plugin work with the google shopping cart? How bout where the customer chooses his language of preference first? If anyone made a multilingual paypal plugin they would make some serious bank..
NO CURRENT WP PAYPAL PLUGS ARE BILINGUAL!L>!>? @admin, my customers site won’t be built for weeks, was going to try it in my website as a playground to see if it does what I need. @Tracy, Can’t you just buy the product test everything out then upload it to the target site once you are happy with it? @Nate, nope, eStore won’t work like how you explained unfortunately. I am building a site for someone else and am wondering how I can buy your products, test them on my playground site and then move them to my customer’s site once I know they will work with pages that haven’t been built yet. Trying to set something up specific and wondering if this plugin can do it. Is this possible to set up with your plugin? @Butterfly The eStore does not do multi currencies. You can use any currency that is supported by Paypal but only one at a time. My buyers will be global. Will multiple currencies be accepted? Hi Wayne, We do plan on adding Google checkout and Authorize.net shortly but I can not give you a time frame as to when this will happen. As for customer account look ups we do not plan to add this feature at this time. OK here’s another question, how about customer account lookup, so a logged in customer see thier order history. Will you be adding Google checkout at any time? just bought WP eStore and trying to set it up with PayPal and IPN. Paypal is asking me to fill in “Notification URL”. What would I use? Hi Keith, This sounds like your currencies are not configured to be the same. Please check the settings in Paypal and the Simple Shopping Cart. Let me know how it goes. I have set up the simple WP ecommerce plugin and its great, just one question, when I add items to the cart, which are in GBP, when I go through to PayPal everything is converted to Dollars but at the same price, nothing is converted to the correct price. Is there anyway this can be fixed as most of my buyers will be from the UK and Eurpoe? Hi Jones, The eStore plugin does not have file size limits. However some servers do have a file size limit (this is not a big problem there is a work around) =). hi what is the maximum size of the file of the downloads that can be uploaded? Hi Shawn, Once the file is downloaded it can be unzipped over and over. But they can only download the file for as long as you set the encrypted link for (e.g 12 hours, 24 hours and so on). Hi there! I downloaded your software. It looks perfect. I am wondering what happens after the customer gets the zipped file? Can they only unzip once or can they then forward the file around to all of their friends? I am trying to create a one-time license type experience with a video. You will have to do some manual tweak yourself to do this. You should be able to use the variation control field to list the “Referred By” option. Then in the post payment processing handling script you can get the value of the “Referred By” field from the name of the product (it will be appended to the product). Then the value can be saved in a database field. Is it possible to include a custom field during checkout that would get stored in the database with the order? I want to include a “Referred By:” field which would be a drop-down box with the names of all our product evangelists. Most likely I can just add this field to the database and change the php files accordingly, unless there’s some reason that would not work. The code inside that “if” statement block is the coupon code field stuff (it’s in a table row). The second option, i want to put the coupon field on top of a stylish background just below the cart table, i’ve managed to do so with the other elements but i can’t figure out how to extract the coupon field from its table without messing things up. Hi Hein, do you mean to totally separate the coupon code field from the shopping cart and put on a page or it’s still going to be in the shopping cart but just moving the position to the top (before the item names)? Great plugin and i’m getting quite familiar with the set-up and the customization of the integration inside my wordpress theme. Only have one question, is there a way to extract the coupon code field from the cart, i want to put it on top of the cart inside a page. It depends on how you want to sell the webinar… what do you have in mind? i’m thinking of purchasing this plug in — i currently have downloadable ebooks to sell, but down the line i would like to sell webinars via the site. is this possible with your plugin? Hi, after the payment the shopping cart is not empty. I’m sure I read that issue before, but I can’t get the page it was. After the payment I use a thak you page and on this page I’ve placed the tag: [wp_eStore_transaction_result:end]. Did I do anything wrong? Thanks in advance. @Crystal, I need a little bit more info about the “Mailing List Plugin” like what kind of integration option it allows and should be able to tell you more. Any way to integrate your eStore Plugin and Affiliate Plugin with the WP Mailing List Plugin from Tribulant, in lieu of using your third-party integration with Aweber? Also interested in the gallery plugin integration and how well it would play with these others if all installed simultaneously. Can this plugin handle sales with zero dollars? Meaning if you have something priced at say $49 and you offer a free promo using a $49 coupon, what happens? Does it just skip Paypal or is it even possible to do this? @Ninja, Yep, you can sell anything you like. I am selling a service myself with this plugin (http://www.tipsandtricks-hq.com/plugin-installation-setup). You can integrate with Aweber so when someone purchase this service they get the pre-configured email. Can the eStore plugin be used to simply sell services as well? I’m looking for something where I can sell a service, then an automated email is sent (maybe through Aweber). Sometimes there may be an attachment, sometimes not. Will yours work for this? @Ville, You can manually modify it to open a pop up but I don’t do this as I am not a fan of pop-ups (it gets blocked anyway). You can add the shopping cart to the sidebar of your site so customers will always be able to see the cart as they are browsing though. Hi, is there a way to have the WP eStore checkout page open another pop-up window once clicked? So if they continue to shop, can have the cart update later. Instead of loading in the same window that customer might want to go back to shop. Good day! Question for you. Your plugins. Are they licensed per site or can I use them on several of my sites? Second question, do you offer a overall price for the affiliate, shopping cart, membership and estore? @Krista, to have a membership and affiliate site you will need the WP eMember and the WP Affiliate Platform plugins. You can start with the WP eStore plugin then add in the others later. All of these plugin can work independently or together depending on your needs. I am going to buy your estore plugin and had a question about it. In order to have a membershipaffiliate site what plugins do I need? I’m not sure how to set this up. I want to have the blogstore where I can give some free stuff away but where for a small fee they can get the membership with products added monthly. So I would have a free membership and a paid one. What plugin besides the e-store would I need. I saw where you had a combo with the store and affiliate plugins together for one price. Would I buy that and then add the e-member script or do I need it? Would I then link it to my website or do I even need one? I appreciate any help you can give me.